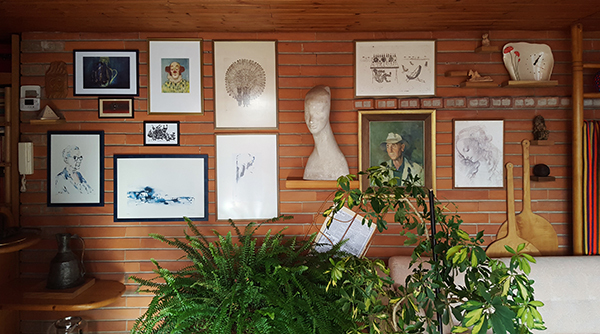 While interviewing architect Stanko Kristl, a representative of the oldest generation of Slovene architects who studied and trained with Professor Edvard Ravnikar, we could experience what passion for architecture really means. Despite his venerable age, architect Kristl is still very much active in his area of work: he is currently completing a house for his nephew, coordinating the last details of construction and furnishing. He is an example of a man in his advanced age actively making use of the knowledge and expertise acquired through his long lifetime and transferring it to younger generations. Of course, it is not his age that makes Kristl a great architect, it is above all his realised projects, many of which are regarded as the best examples of their category/typology. This is true whether we are speaking about a school, a residential project or medical facility; not least, his kindergarten Mladi rod (Young Generation) in Ljubljana is still one of the best and most interesting kindergartens constructed in Slovenia. The title topic of the present issue is represented by two comprehensive articles on the Dušan Džamonja Sculpture Park in Vrsar, Istria. Sculptor Džamonja conceived the Sculpture Park in the vicinity of his summer residence/weekend house on the Croatian coast, and gradually filled it with his own sculptures. The park represents a rare example of an artist laying out a park with his own sculptural creations, meaning that Džamonja was able to decide himself where each of the sculptures was positioned, in a carefully considered way, and in a space that he knew well and felt at home in. Today, the Sculpture Park is open to the public, and when we wander through it and admire the individual sculptures we can relive the time in which Džamonja was creating large sculptural stories in the then Yugoslavia. Amongst other things, he designed the sculpture in Podgarić, Croatia, while the most imposing of all is the monument at Kozara, Republic Srpska, Bosnia and Herzegovina, a memorial sculpture that lifted the then Yugoslav commemoration of the national liberation struggle from monumentality to the level of abstract fine art. Indeed, we can say that both Stanko Kristl and Dušan Džamonja are more than just masters of their trade; they each left a strong mark on the Yugoslav architectural and sculptural history, they are masters from whom younger generations of architects and sculptors can still learn a great deal. Let us highlight two projects from the oeuvre of contemporary architecture presented in this issue. Firstly, a Croatian project located only a few kilometres from the Dušan Džamonja Sculpture Park; not along the coast, but in inland Istria. In cooperation with an enlightened and perceptive investor, the Mikelić Vreš Architectural Office gave rise to an important achievement in the design of modern architecture, a work that is intertwined with the local Istrian context, with the erection of building volumes around an internal courtyard and the use of the local Istrian stone. The entire complex is carefully conceived, from landscaping to individual details, thus upgrading an Istrian story of acquiring herbs and aromatic plants, transforming it into a successful story of their processing into natural medicinal and cosmetic products. The second highlighted architectural work is marked by a project of the Faculty in Brno, of the studio of architect Peter Pelčak, who conceived a building with a large volume in the city, supplementing the missing building tissue, and most importantly connecting the tradition of Czech interwar modernism with the contemporary language of design. An overview of contemporary design in Slovenia is presented by an article revealing that Slovene design is currently in a phase of a more or less zealous approach by individuals: from the idea to design, manufacture, promotion and sales. In short, one person for everything. Time will tell whether the new generations of architects, designers, sculptors and artists will achieve their own mastery too.